This week: Abstract FiberFact #2: Abstract Fiber yarns are dyed to minimize pooling and striping. While it’s impossible to prevent these effects entirely, we make every effort to create an overall textured effect and avoid pooling. 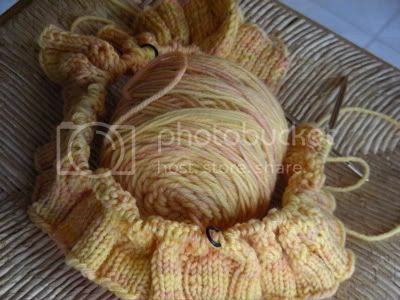 This means Abstract Fiber yarns are suitable for showing off complicated patterns, like textures, lace, cables. The colors in the yarns are also perfect for colorwork using a more solid background color and just one of our handpainted colors to create a very dramatic design. 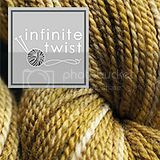 Join our group on Ravelry, Aaabsolutely Abstract, for a list of shops who carry our yarns. Orders over $100 from our website ship for free in the US and Canada. This week: At Purlescence Yarns we are diehard cross-crafters. When we're not knitting, we're spinning, quilting, stitching, or weaving. We have been very pleased to include looms and weaving supplies amongst our offerings at the shop. This week we warped up our Schacht Wolf Pup 4 harness floor loom. It's a beauty! It's easy to operate and folds up for portability. It's all function in beautiful form. We're taking orders for the holidays now! Gigi has finished her black Regia Saturn socks, and the crocheted edging. Jasmin has found better buttons for her Tangled Yoke Cardigan. Gigi has finished the front of her Origami Wrap Pullover. Jasmin talks about unearthing a 10-year-old UFO that has one seam left to do. Jasmin is thinking about knitting "Boo" the Tweedy Pie Jacket (from Monkeysuits). 9/19, 11 am - 3 pm: Spin in Public Day at Courthouse Square on Broadway in downtown Redwood City. 9/27, 11 AM: Shuttles, Spindles, and Flyers guild sale. 10/17-18: New York Sheep & Wool Festival (Rhinebeck). Meet'n'greet TBD. Gigi discusses buttonbands! Jasmin mentions the pink Pep sweater. Jasmin's Ariann, when she pulled it out of storage, was knit the wrong size. Gigi's Swallowtail Shawl (errata here) was ripped and re-knit. Gigi doesn't recommend using quilting thread for lifelines, and finds the math for the shawl vexing. Jasmin's Drops Yoke Cardigan turns out wrong. Jasmin might run out of yarn for her Tempting II. Jasmin finished spinning the "Hey Jude" from Crown Mountain Farms. (Jasmin recommends listening to this episode of "Stitch it!" to hear about worsted vs woolen plying.) Jasmin talks about a more holistic approach to spinning for projects. We found a more commercially available 45 degree angle kate, by Louet. Uh oh! Sherbert couldn't find your page. Sorry - cuteknaitter isn't a Ravelry user. But that's okay, I just deleted the "a". Love the colorway name... Butter Peeps! LOL!